Two weekends ago, I went morel mushroom hunting. This is an annual trip that Mary Jo and Joel offer as a service item each year at the Unitarian Universalist Church of the Palouse that I attend. We did not find morels--well, Karen did find two very small morels! But what we did find were plenty of gyromita montana--more commonly known as snow mushrooms or "fake morels." They are called snow mushrooms because they are often found at the edge of snow--the first mushrooms to appear in the spring. They are edible--prepared the same way I would morels--sliced up and sauteed in butter and garlic! What do they taste like? Mushrooms! A friend of mine at work asked about their taste, and I said they sort of taste like butter and garlic! He asked, "Then why bother?" Several answers to that question. First, because it's great fun to be out in the woods, noticing the first wildflowers (we saw trillium), being outside of the office!, finding food like a gatherer! Smelling the mushrooms sauteeing! I used my mushrooms in an omelet and froze some for use in soups and spaghetti sauces later! Now that we've had some warmer weather, the morels should be out! I need to enter those woods again! And today I signed up to participate in the "Seasons of Lace." It's a "KAL"--or knit-along, where the participants will all share progress, pictures, information about the lace items they are knitting as the summer progresses. There are chances to win prizes, but the most interesting part for me is to see what other knitters are doing--their projects, their successes, failures, problems, the yarn they use, etc. My first project will be the Candle Flame shawl (offered on Knit Picks). I bought yarn for this last year--or was it two years ago--using alpaca (Shimmer--that I bought in the Turquoise Spendor). I didn't get very far before I frogged the whole thing. But now, I've learned about using a "lifeline"--running a line of "other" yarn or thread through the knitting. So often, it takes me some time to get the feel of a lace pattern--or I drop a stitch that I can't recover. When you rip out (frog!) lace, it can be quite difficult! But if you put in a lifeline every few rows until you catch on to the pattern it's supposed to reduce that frogging. So, I'm looking forward to June and the start of the KAL! Keep watching for my progress. Spring and Socks and Hats! Yes, spring does come to Moscow, Idaho, even if much later than usual! 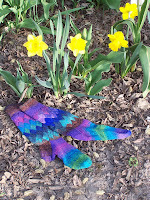 And here's proof positive--my finished Annetrelac socks with the daffodils blooming. Actually, I finished them at least a week ago, but I took time to soak them with conditioner since I sure didn't like the feel of that yarn. They did bloom a bit (like the daffodils!!) and they feel much nicer now. I'm going to keep them for myself and show them off with my summer sandals (yes summer will also come--and usually, quite quickly!). The toes are different colors--one is turquoise and the other purple--I normally work like the devil to get both socks to match exactly, but with this Noro sock yarn, it wa s impossible! But I think they're pretty cool anyway! I did start and finish my first Fair Isle sock--alpaca yarn with an Egyptian cotton quilting thread knit into the foot. So very soft. I used only 60 inches, and the Fair Isle tightened up the leg of the sock, so they may not fit me. But I did "pick" the green yarn, holding it in my left hand, and throw the beige with my right. Sometimes, I had to untwist the green, so I have some way to go to perfect my two-color knitting. The second Fair Isle sock went into hiatus as I worked on this lace Fountain Hat (Interweave Knits.com Spring 2008). Actually, I made two--I used the superwash Merino "Grass" that I purchased from Sundara Yarn (you can Google it on the net). Her overdyed colors are just great. This picture doesn't show the subtle change in the color green. I made a pair of socks using the Hedgerow pattern with Sundara's Cobalt over Mediterranean--a dark blue--that I donated last month to the silent auction at our church (and had two people bidding over them!). This hat will be a nice summery hat. It still needs blocked, so that the lace will open a bit. 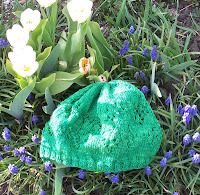 I made two baby hats this weekend--sitting at home, feeling rotten, even though the weather had turned beautiful. Our Woolgatherers' group has donated more than 50 hats to the birthing center here in town. Very rewarding--finished quickly and using up all that stash of acrylic! But I swear, my next project (besides the second Fair Isle sock) must be to finish the alpaca sweater I'm making for myself--So little to go! Since my office is cold all summer, I'll be able to put it to use! I work with many engineering graduate students at the University of Idaho--they always get offered good jobs--often, before they finish their theses. We warn them--finish them before they leave: "You just don't realize how hard it is once you leave school and "have a life" how hard it will be to pick it up and finish it." And we have student testimonies to that. Well, my sweater is just like that unfinished thesis. With the back, sleeves and one side done, I know it's going to take me a good couple of hours just to figure out just where I am on that almost-finished second side! Well, do as I say, not as I do!